The great thing about living the nomadic lifestyle is that it's very easy to just.... go - sometimes at a moment's notice. The ability to be completely spur-of-the-moment has a way of presenting opportunities and sometimes even savings. For the past few years, regrettably, we admit that we've both needed a good bit of dental work, but just simply didn't take the time (and didn't want to spend the money - no dental insurance) to get the work done. On top of that, it's insane what dentists in the United States charge for some of their procedures. I (Eric), according to at least two dentists in the Orlando, Florida area, needed two, possibly three implants, two crowns, and a number of fillings. All told, anywhere from $6000-$7000 or more. With Jeanine's medical bills for her back, it simply wasn't in the budget. In addition to the work that I needed to have done, Jeanine also needed a couple of fillings and at least a crown. By the time we factored in everything that we would need to get our teeth back to where they should have been, we would have spent well over $8000. So, like many things, we had to put it off until later. Transportation costs - this was broken down to whether we should park the trailer long term and have our dog sitter stay, or travel with the trailer (most likely Mexico) and take the dogs with us. Cost of accommodations - whether we flew and rented a place or drove and paid camping fees. Cost of procedures - if we weren't going to save that much money, it didn't make sense to make the trip! Safety of area - sure, we want to save money, but not at the cost of our safety! Quality of work/care - we wanted to have our cake and eat it, too. We wanted dentists that were qualified based on the same standards as US dentists. Where? - we knew that we were going to need at least 15-20 days (so the dentists had time to fabricate what we needed) wherever we went so we thought it was smart to make it somewhere that we actually wanted to go. 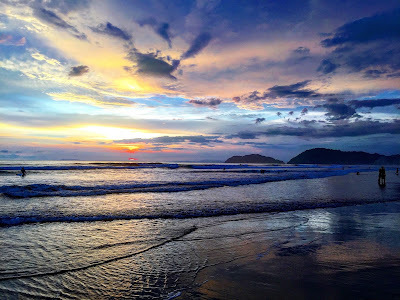 Taking all of these things into consideration, it really came down to two places - Los Algodones, Mexico or Jacó, Costa Rica. Our first thought was, since Los Algodones was so close to the border, it would be easy for us to "swing by" on our way back from the western US. The only problem with that idea was that we wouldn't be able to do that until fall 2017 at the earliest (without being significantly out of the way). Another thing that we found out was that, despite having the lowest prices, Los Algodones didn't have the best track record in terms of facility quality or the quality of the care received. 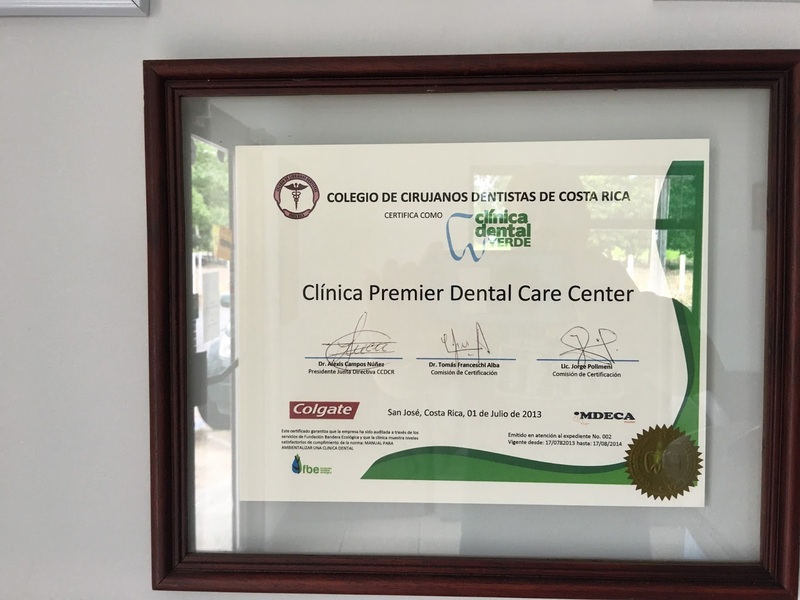 This ultimately ended up being the reason for our decision to have our dental work done in Jacó, Costa Rica. Our house in Cocoa Beach was scheduled to be sold and closed on the 15th of August so I started looking at the fall to see if we could squeeze a trip in after the closing of the house (plus a wedding in Pa) but before we planned on getting back on the road in the middle of September. This gave about a four week window with which to find something that might work for us. Fortunately, given our past and current work in the travel industry, I knew that it was prime season for cheap travel! 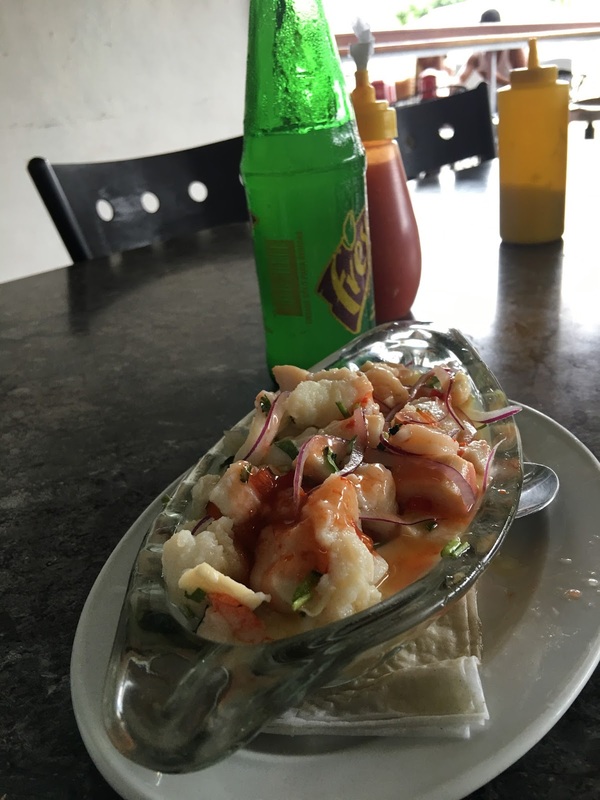 Some of the best Ceviché we've ever had! Typically, the way that I search for travel is to get a gauge of what the accommodations are going to cost. 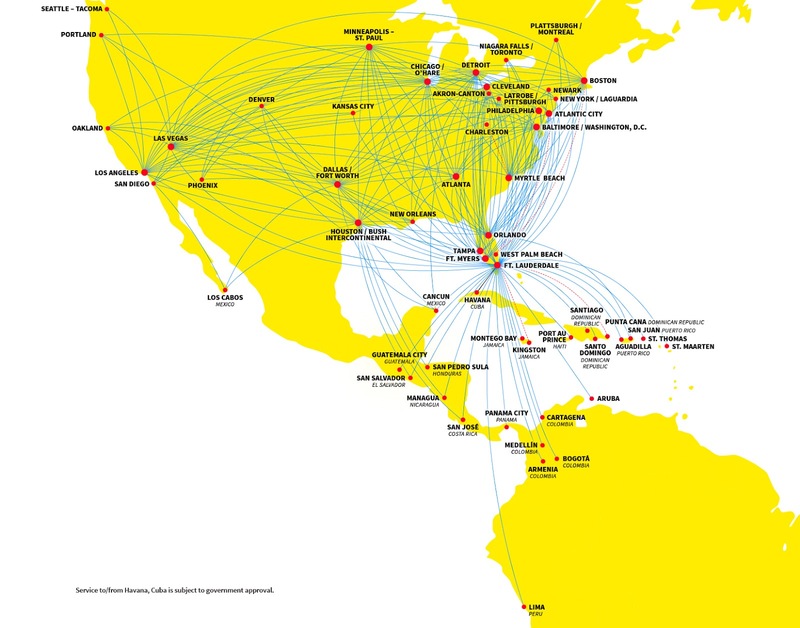 Airfares are usually pretty similar for the low cost carriers, so there isn't going to be much variation in the costs. Plus, when you're looking at spending at least two weeks, the cost of accommodations plays a much larger factor in the overall costs. We aren't usually the type to stay in hotels, but occasionally, it is nice to have everything taken care of. That being said, not in Jacó! Hotels were outrageously priced. Not in the way of hotel pricing, but in costs in general. The least expensive (that wasn't a crappy one!) was nearly $100 a night! 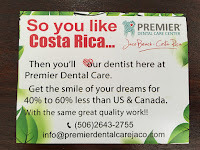 We were planning to stay for two weeks and wanted to spend money on our dental work and experiencing the food, drink and culture of Costa Rica. Airbnb has always been hit or miss for us. For shorter stays in major cities, there's no comparison. But for longer stays ie two weeks, we usually do much better on VRBO (Vacation Rentals By Owner). After looking at many places, we decided on this listing in south Jacó. Known as a Tico style home, it was perfect for what we needed - inexpensive and close to the beach. On the downside, no air conditioning. But it was during the rainy season which usually cooled things off, at least as far as our experience living in Florida taught us. 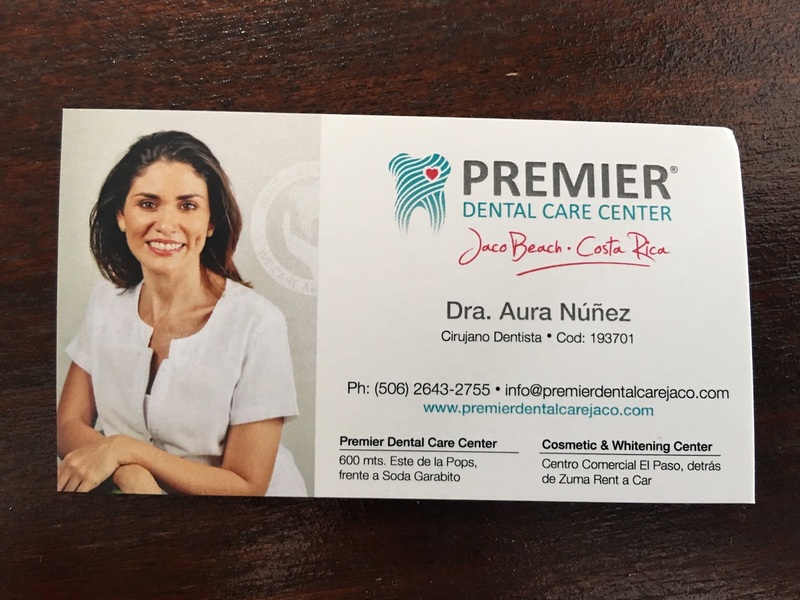 It was also a very reasonable taxi fare - about $5 roundtrip from Premier Dental Jacó where we ended up going to get our dental work completed. At just over $400 for two weeks and only a five minute walk to some of the cleanest waves I've ever had the pleasure of riding, this spot was perfect for what we needed. Sunsets like this only a 5 minute walk from our tico! surrounding areas. So, after weighing the options, our Airbnb host offered round trip transportation for $100 including any stops for groceries, etc we wanted along the way. We also thought that was a great way to gain a lot of insight inside local knowledge as well. We could have taken the bus, which was significantly cheaper, but it would take 3-4 hours as opposed to just under an hour. Since Jeanine had another back procedure a few days before departure and was ordered to rest for two weeks (the other reason for the trip), riding on a bus for that duration of time didn't seem to make sense. So yes, the cost exceeds our original proposed budget, but for the sake of Jeanine's back's health, we opted to spend the extra money. So there it is. Initially, when we first started looking and doing the research, we never considered that we were advised to get work done that we didn't actually need to have done. I guess I shouldn't be surprised. The largest cost savings didn't come from the difference between the services provided - it came from having work done that needed to be done, not what could have the most profit made. Maybe that's being a bit cynical, but numbers (and thousands of customers) don't lie. Factor in the cost of transportation, accommodations, and dental work and it's just under 20% of the total cost of what we were told we needed by dentists in the US. 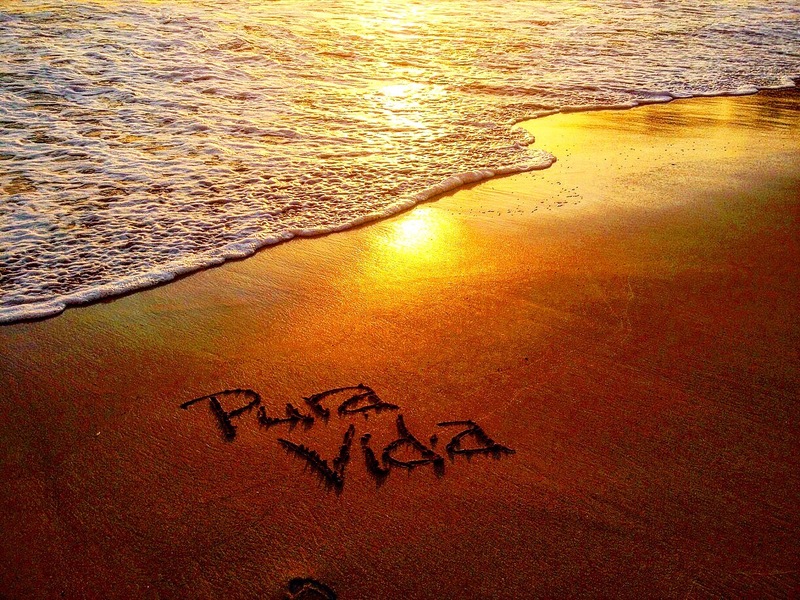 Oh yeah - we also got to spend two weeks in one of the most beautiful destinations in the world filled with some of the friendliest people, black sand beaches, and glassy walls of waves regularly. Didn't seem like a bad deal to us either! So now you know the expenses comparatively speaking. The only other thing to look at is the cost for goods, services, etc, ie cost of living in Jacó vs the US. Turns out that most things service oriented are quite a bit cheaper whereas foods, products, tangible items, etc, are on par or slightly more expensive. There was a bar / restaurant just down the street from our place that we could easily have lunch or dinner with a few beers for about $15 US. Jeanine's onlay crown - sadly no diamonds! For the day to day living, we would spend slightly more than we do in the US since we didn't have as many things on hand to cook with such as spices. We did tend to eat out for more meals, but we always tried to seek out the less expensive options. For example, you could get the typical Costa Rican lunch which was a protein, usually chicken, steak, or fish, accompanied with red beans and rice and a side salad for about $5 US. Trust us when we say that it's filling. If you walk away hungry, you ordered the wrong thing! Taxis were very cheap as well. 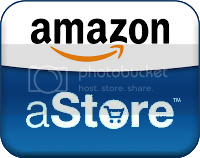 We found that we could get around for about $2-3 US dollars to most places in town. Return of the pearly whites! Don't miss Jacó Fine Meats for all your carnivore needs! As far as everyday life, most of our days were spent working, reading, surfing the internet/watching Netflix, or just swinging in our hammocks. Our Airbnb had a small spring-fed pool (we emptied the water every few days and refilled) that was refreshing albeit shallow. We found that setting up our chairs in the pool was the right combo of refreshing and warm! Around town, we found many shops and restaurants that we enjoyed. You'll definitely want to check out Jacó Fine Meats for the best bacon in town. Bonus: if you ask nicely, he might just season up and marinate a piece of meat for you! Tell Craig we said hi! There is a great farmers market every Friday with tons of local fruits and veggies. You'll also want to check out Hotel Poseidon. We went there for lunch and drinks. If they have it, get the Tuna Poké! It was incredible! I was going to take my surfboard, but decided against it after looking at the baggage fees the airline was charging. Even though they classified it as sporting goods, I would have had to pay $170 roundtrip to take mine. Before committing, I spoke to our Airbnb host who directed me to Carton surfboards just around the corner. I was able to negotiate on a great board (and swap it out to try others) for $150 for the entire two weeks! This worked out perfectly since I ended up changing boards three times before settling on one for my size and skill level. 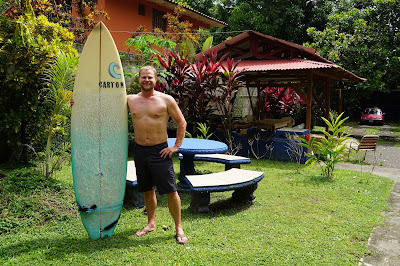 I got in some great surfing and definitely recommend Jacó for all surf levels - beginner to advanced. If you're looking for something a little larger, just take a short drive (or taxi) south to Hermosa Beach. Shoulder to head high glassy waves are not uncommon! That pretty much sums it up. In total, after all things included. 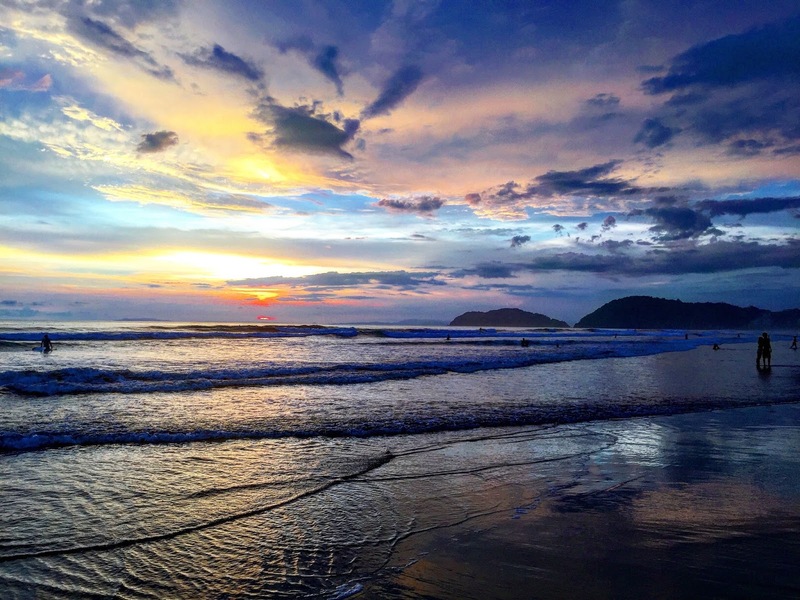 We spent just under $3000 US for two weeks in Jacó, Costa Rica. 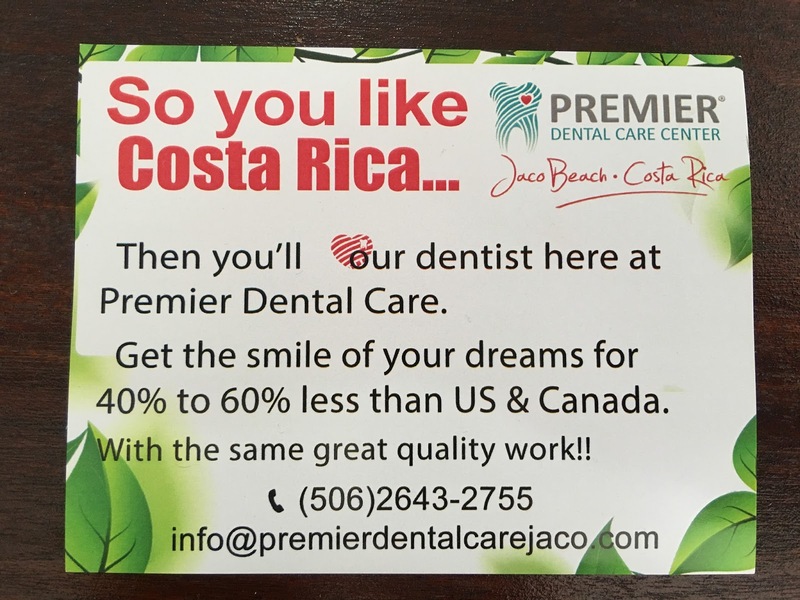 This includes all of our dental work, food, drink, accommodations, entertainment, etc. We couldn't be happier with our decision! In the end, we got a two week stay in one of the most beautiful places in the world, all of our dental work completed at a fraction of the cost and no compromise in quality (I would call our dentist more of an artist after having her clean our teeth - no hygienists here - and handcraft our temporary crown in seconds), and is now a place we will plan to return to on an annual basis to have our checkups and cleanings done. 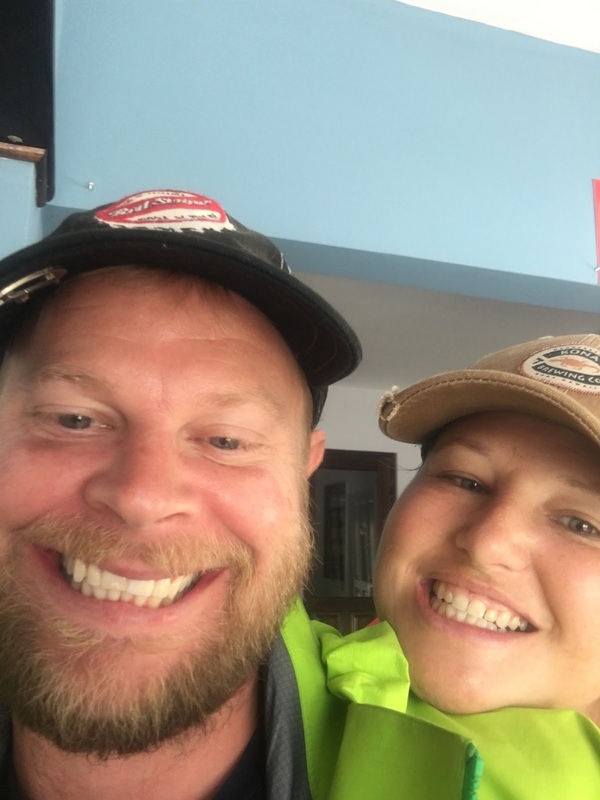 In addition, Eric does plan to have the implants done in the future, so the difference in costs will more than make up for the upcoming years' trips.